Maggie Campbell, Sabriyah Stallion, Timothy Rice, and Aaron Williams, clockwise from right, program robots in a robotics class at Tech Town's winter break camp in the Edney Innovation Center on Friday, Dec. 22, 2017, in Chattanooga, Tenn. Tech Town offers technology-centric camps and education for children in subjects ranging from video production and computer coding to electronics and robotics. More than 60 local students spent their winter break in Tech Town classrooms designing their own Christmas ornaments, producing holiday videos and working on robots. The local nonprofit organization, Tech Town, is a technology and entrepreneurial learning center that offers year-round after-school programs, in-school partnership programs, field trips and camps during Hamilton County schools' break periods. The students, ages 7 to 17, are grouped based on age and interest. The Kilobytes, ages 7-10, designed a holiday ornament to be 3-D printed or produced a holiday greetings video. The Megabytes, ages 11-17, worked on robotics projects. "The goal is to get them started early in STEM or STEAM," said Chris Ramsey, Tech Town CEO. "And hopefully it will open up a career path." Throughout the year, Tech Town brings STEAM — science, technology, engineering, art and math — opportunities to students across Hamilton County and the surrounding area, but also focuses on schools with the highest need. The organization now partners with schools in the Howard feeder pattern — Orchard Knob Elementary, Orchard Knob Middle, East Lake Academy and the Chattanooga Girls Leadership Academy — on a variety of projects, including providing classes on videography, 3-D design, scratch coding and robotics. Ramsey, a Chattanooga native and Brainerd High School graduate, said the focus is intentional. "Our goal is to get Howard to be a school of choice," Ramsey said. "We are designing technology lessons and programs based on the teachers' needs at those schools." Howard held its first robotics competition this fall and competed against area schools at Chattanooga State in November. Tech Town doesn't focus solely on high-need areas of the community. It offers services and programs across the district, holding events at churches, youth and family development centers, and even for Redemption Point Church's home-school program. "We make sure we serve the entire community and that all kids have to access to [Tech Town]," Ramsey said. One of the organization's goals is for camp attendees to reflect the diversity of students across the district. The 61 students who attended this year's winter break camp represented 37 schools. Boys made up about 67.9 percent of the attendees, a trend often seen in STEM programs, with girls making up the other 32 percent. There was an almost even split of white and black campers based on a survey taken Wednesday, the first day of the camp. Camp costs $50 a day and includes lunch and snacks and programming from 9 a.m. to 3 p.m. Scholarships from individual and corporate donations pay for students who might not otherwise be able to attend. More than one-third of this year's campers receive a full or partial scholarship. The goal is to expose students early to technology and skills they will need for the workforce. "We try to let them know they are capable of doing amazing things," said Tech Town instructor Dustin Smoote. "Sometimes when someone thinks of engineering, they think of these sophisticated, complicated things, but we break it down and show them that though it is sophisticated, it can be fun." Smoote, a senior in computer engineering at the University of Tennessee at Chattanooga, has worked part time at Tech Town camps for a couple of years. "At the rate these kids are going, they'll be building amazing things by 18," Smoote said. Camper Sabriyah Stallion, a sixth-grader at Orchard Knob, attended a Tech Town program in elementary school but never worked on coding a robot before. Her partner, Maggie Campbell from Loftis Middle School, was on her elementary school's robotics team. 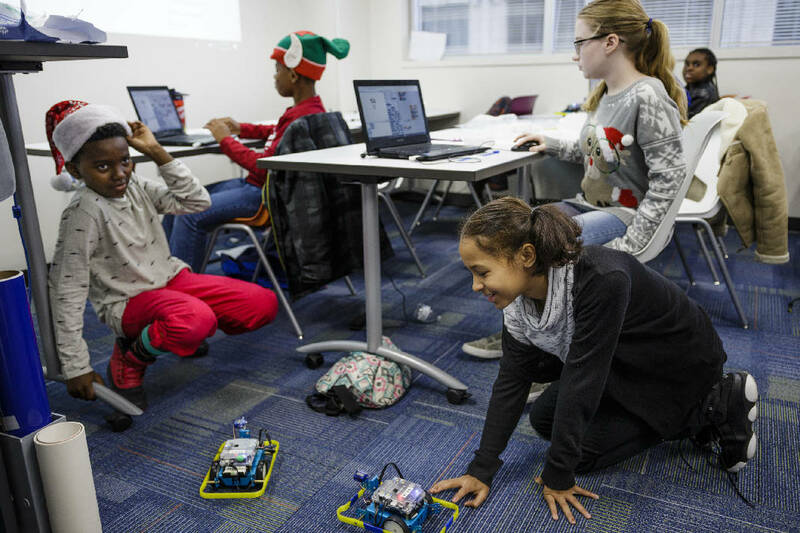 The two girls worked on programming their square-shaped robot on wheels to move in a circle, a figure eight and a square, as well as getting it to launch a "snowball," (a ping-pong ball) during the camp's snowball fight. "My favorite part is the coding," Maggie said. "I have a robot at home that I work on code [for]. I use it mostly to chase the dog around." She said she didn't learn things like this at school. She wants to work in science when she grows up, as a meteorologist, or as a corporate lawyer. Earlier this month, Tech Town announced a new partnership with software company Autodesk to provide industry-grade software to Tech Town and local schools that students can be trained to use. "Autodesk software is used by professionals in STEAM fields globally, and bringing it to Chattanooga's children will unlock a wealth of career opportunities for them as they move from school to the workforce," TechTown Foundation board chairman Mike Harrell said in a news release. The overarching goal is to reach students where they are and give them access to skills and tools that will prepare them for the future, whether that be learning Autodesk software, how to edit videos, or designing ornaments to be printed on 3-D printers for the holidays. "We like to say 'build something amazing,' that's our motto," Ramsey said.